Manufacturer & Supplier of Cable Trays for Desks. Our product range also comprises of Cable Trays, Perforated Cable Tray and Stainless Steel Cable Trays. Our organization is regarded as one of the leading manufacturers and suppliers of optimum quality CableTraysforDesks. To manufacture best quality desks our professionals use high quality mild steel and modern machinery that are installed in our infrastructure. Before the final dispatch of these trays, our professionals check each and every piece on several of their check points. Offered trays are hugely appreciated among the clients for their dimensional accuracy and customized dimension. 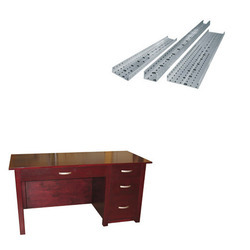 Looking for Cable Trays for Desks ?